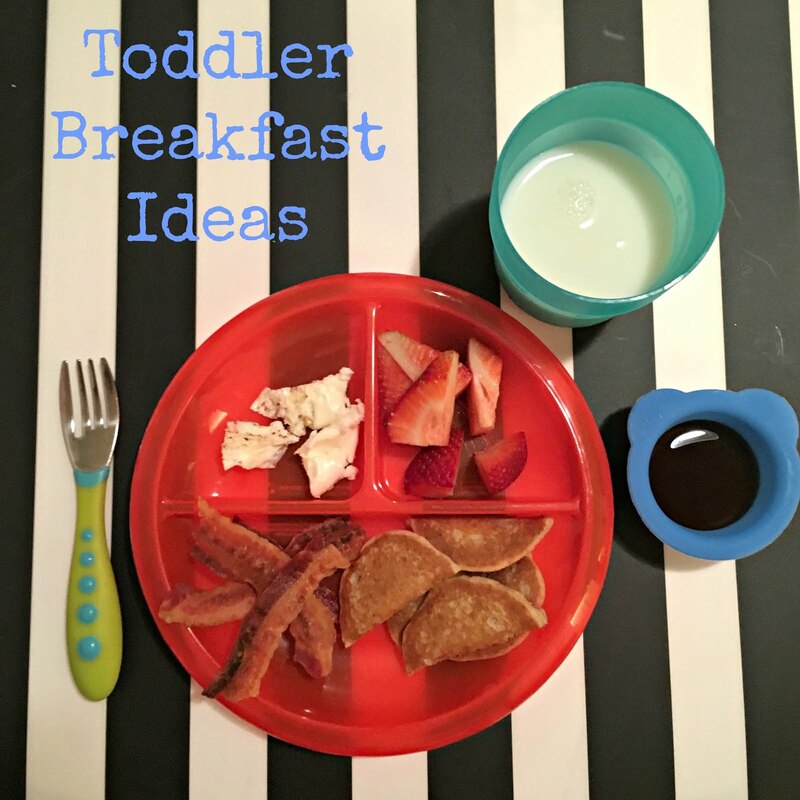 Struggling to get your little one to enjoy "the most important meal of the day"? 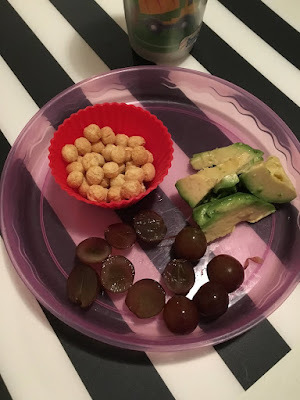 Read on for some yummy ideas! I was the worst breakfast eater as a kid. I admit it. I loved cheese toast and Nutrigrain bars, but that was about it. It wasn't until I was much, much older...like out of college older, that I started to appreciate the joy of breakfast and brunch (and of course the mimosas that go with it, wink wink). Heck, now I even fix "brinner" (breakfast for dinner) almost once a week. 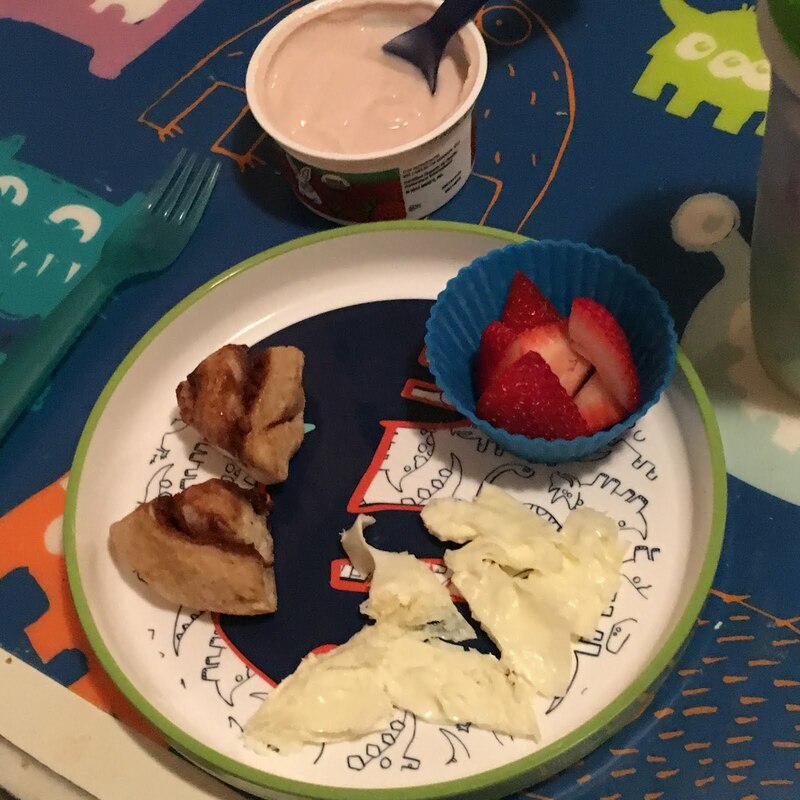 Now, as a mom to a 3 year old with a pretty decent appetite (although with all toddlers can be hit or miss), I find joy in coming up with fun yet easy, healthy yet appealing breakfast plates for my little dude every morning. Oh, and did I mention that they have to be quick? 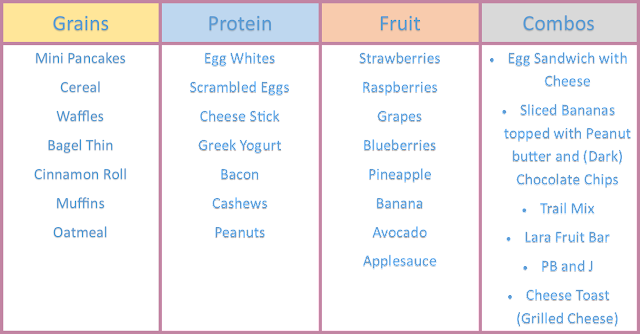 In an attempt to try to make every morning yummy and not boring, I compiled a list of some of my son's favorite things that are my "go-to" items when I am coming up with breakfast creations every morning. I try to mix and match and keep it fresh and new. 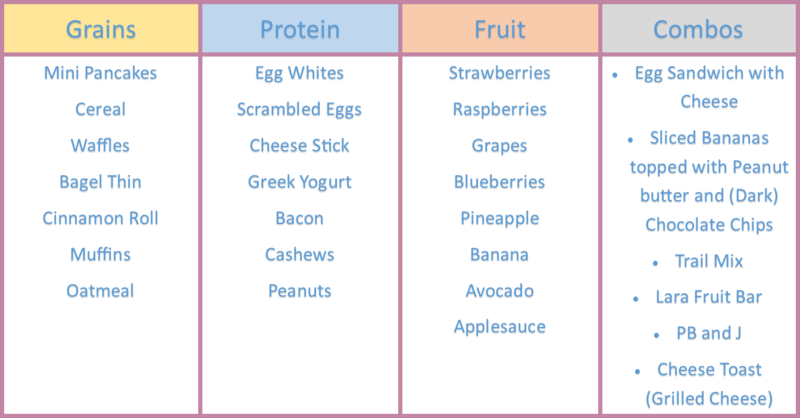 *Truth: He doesn't like muffins that much and has never had oatmeal, but these are things I'm planning on introducing and integrating soon. Egg and cheese sandwich on a bagel thin , cashews, vanilla greek yogurt topped with dried strawberries. Kix cereal, avocado, red grapes. Egg whites, bacon, mini pancakes and sliced strawberries (side of syrup). Cinnamon roll, egg whites, sliced strawberries, strawberry greek yogurt. And, of course, for special occasions (like a 3rd birthday)...always add whipped cream and sprinkles! Sliced bananas topped with peanut butter and dark chocolate chips. 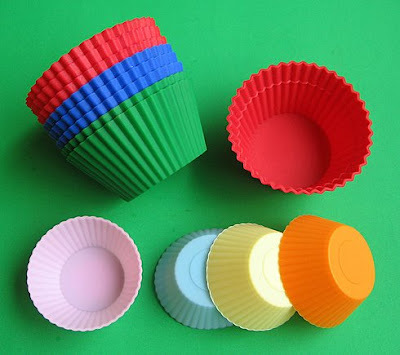 Silicone cupcake liners- These are perfect for portion control when it comes to chips or dessert, holding dipping sauces like syrup, ketchup or ranch, and things that roll around easily like Kix cereal. 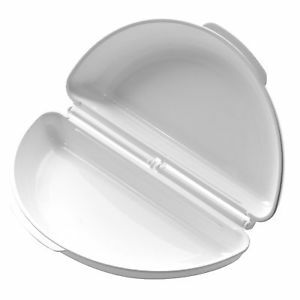 I use these in some way on E's plate every single day. Omelette Maker- I picked this up from Publix for under $5 and love it. You can either scramble the eggs and pour them in for an omelette feel or you can simply crack an egg on one side, close it and microwave it for 1 min. Boom. Done. Eggs for breakfast in no time with zero pans to clean up. Fully Cooked Bacon - I have never liked to cook bacon in my house. I feel like it is messy, grease gets everywhere and you can only do a few pieces at a time. Since my son loves bacon I found that the quickest, least messy way to get it on his plate in the mornings is to buy fully cooked bacon. Again, microwaved for 1 min and it's ready to go. I love the convenience and he loves the taste. Perfect. Mini Pancakes - Little kids like little things. These little mini pancakes are awesome. They have a maple syrup flavor and most times my son doesn't even want extra syrup to go with it (score), he likes the pancakes dry. Instead of microwaving these little guys I usually just put a few in the toasted for a minute and they are crispy on the outside and perfectly pillowy on the inside. Delish! Larabar - I love the simple ingredient list on these fruit bars. Everett thinks he's getting a "treat" when in fact he's getting a good dose of healthy nutrients. The ingredients in the cherry pie bar (one of his faves) is unsweetened cherries, dates and almonds. That's it. 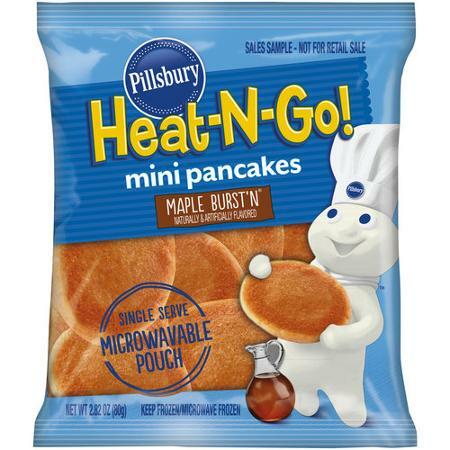 These are great for breakfast and on the go. Microwave Cinnamon Rolls - Who doesn't love cinnamon rolls? I do, but I don't have 25 minutes to bake them every morning. Well, I found these little gems the other day and am in love! The marketing on the package is true. They take 60 seconds in the microwave and are ready to rock. I leave off the frosting to cut down on the sugar, and my little dude doesn't miss it.